The Project. Authentic. Date Plan. Treated to a lunch box by Mariko during the lunch break, I had a conversation with her about how quickly had the April passed and then she asked me about my schedule for this month. The only thing I have decided so far was the date on this Saturday. Since I had no idea what waited ahead, it was hard to think of a plan. As I was unable to explain, Mariko peered at my face with a pondering look. I have nothing in particular for next week, I ended up answering. Mariko nodded with a big smile... somehow, making me feel guilty. I wondered if I should tell Sayuri and others that I'll be going on a date with Tomomi on Saturday. While distressed about it, I rang room 501's intercom and the door opened immediately. Sayuri's today coordinated appearance, was exactly like one we saw on one of the store's mannequins at Shibuya's Maru-kuu. "It looks good on you, Sayuri." "Is that true, Onii-sama! Thank you very much." Happy and shy Sayuri made me pass through the room then passed me tea she prepared. The Myna Bird Kyu-chan spoke when it saw me. The image I've held of Sayuri was that of someone who holds the strings of her purse tightly... her usually firm self had ended up backlashing last weekend. With tea on the tray and facing down, Sayuri returned from the kitchen. "Kyuu-chan, why can you select things so accurately?" "Uuu... be quiet for a moment." With a troubled expression Sayuri covered the bird cage with black cloth and Kyu-chan had gone silent. "Isn't it pitiful, remaining in the dark?" "She'll just think it's night and go to sleep." It feels like Kyu-chan is going to end up having day and night reversed. I sipped some tea and exhaled. "Um, Onii-sama. Shall we deepen our sibling bond today? Of course, if you want to get rid of the framework called 'siblings' I won't hesitate." "Uhh, I'd be grateful, if I could consult something with you today." "Of course! As long as I'm able to, please ask me whatever." "Well, um... it's a consultation on dating." "Please wait a moment! I'll bring the materials." Just when I thought she went to bedroom, Sayuri returned with bunch of magazines, notes and writing utensils. Excited she lined them up side by side on the table. "You're quite prepared aren't you?" "For Onii-sama's sake I have gathered this together." "Do you have a recommended date course?" "Of course. I have summarized the dating spots in Kanto by the area." "I'd be glad if you taught me." When I bowed, Sayuri opened her notes. "Let's start with course 1 then. New Tokyo's radio tower and old town's area date!" "You mean like a radio tower like the Sky Tree? The view from the observatory might look amazing..."
"Onii-sama. Just climbing up that tree isn't appealing enough. Of course, the view is charming but there's a lot of commercial facilities allowing you to enjoy bird's view. This one includes walking down the old town in its atmosphere so it's two in one! Also, there's many convoluted and unpopular alleys in there." As if she had memorized it, Sayuri fluently described it. When I glanced at the notes, all over the map written in red were things like "police doesn't appear", "no pedestrian traffic", "society's blind spot" and "shadows". "G-got it. I see, so it's not just the radio tower. It sounds very attractive, so since it's '1' it means there are others right? You always investigate very thoroughly." "Of course. Then the classic of classics! I'll introduce the Maumauland." She turned to the next page of the notebook and opening the magazine at the same time, Sayuri begun her lecture about the theme park. "There's one in the Chiba prefecture too, an amusement park everyone loves." "But you actually weren't there, were you." "I-it's the first time for me too. For the first time to be with Onii-sama... is too wonderful." The way you're talk is going in a strange direction, Sayuri-san. "But, won't the super-popular spots be crowded?" "That's true. Even if you line before opening of the park, you must run between parades and popular attractions to get on. Ah! It's dangerous to run in the park but... anyway, what's important is how to avoid crowds." "I see. Can I take a look at the notes for a little bit?" Starting with nearest station until the Maihama station where the Maumauland is, there was a schedule written in very small detail. The preferred path between super popular attraction from the the opening of the park as well as an efficient route for walking around the park. The route also had some derivations and alternatives to avoid the expected crowds at attractions, as well as a convenient localization of the roof in case there was rain. "You've never been there, but the prepared schedule makes it seem like you'd like to go there." Sayuri made a troubled smile. "A-actually... it's a direct copy from a magazine." She opened the magazine with the theme park explained. The contents of the page were marked with sticky notes and roughly the same. However, while it was mostly a copy, in the notes there was also information not existing in the magazine. On the map of the amusement park, there were mysterious encryptions like "smooch point", "no surveillance cameras", "there's no one inside (?)". Yup, let's make it so I saw nothing. When I flipped towards the next page in the notebook, Sayuri started to panic cutely. "Aaa! You can't go any further!" She stood up as if to hang over me and tried to steal the notebook back. "Onii-sama is from the young generation so... kyaa!" Raising a scream Sayuri slid on her feet and dove towards me. While still sitting down, her chest was pressed onto my face. There was a gentle scent of the fabric softener and... a soft sensation. 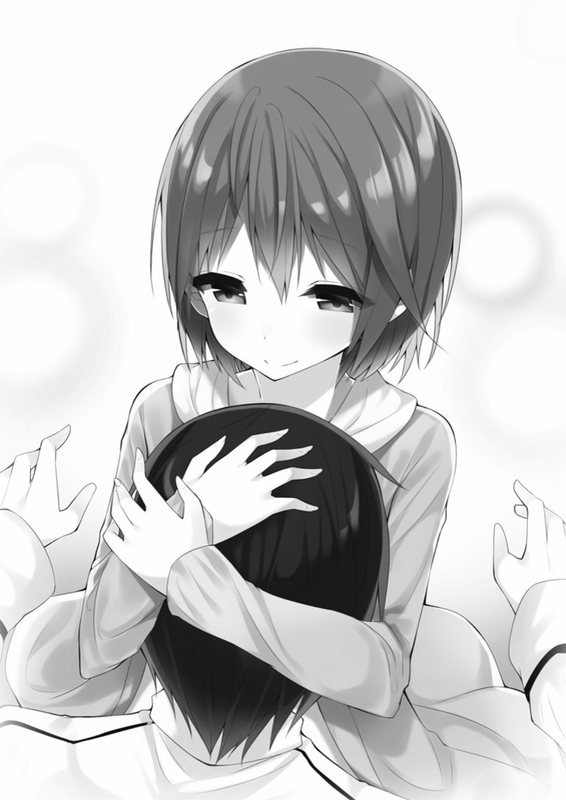 She should have tried to take away the notebook I held in my hands, but Sayuri had hugged my head tightly instead. "Onii-sama, please return it! Please return the notebook!" I somehow managed to slip out of Sayuri's solidified embrace and stood up. "Onii-sama, why would you stand up?" "Would you? Heck! Let's pass embrace as a thing fine to do as siblings. But, why would you press your chest on me?!" "That was just the momentum. Something that crosses boundaries." "Don't cross them! If you're going to do that, then I'll read the secret page you don't want to show to me." I opened the notebook I held in my hands and confirmed. I thought there might be some kind of terrifying scheme, but when I opened that page... it was a well-organized and easy to understand, Sayuri's original date plan. "What what... Tokyo power spot tour in Sugamo." "Hawaaaa! Hearing it aloud makes me too embarrassed!" So pressing your chest on me wasn't embarrassing?!" "Sugamo is granny's Harajuku. I admired it ever since I was in elementary school, it's too embarrassing." "Nono, even I know of the Togenuki Jizo... rather, what are the 'power spots'?" "Places in which spiritual energy gathers, you'll become energetic after going there." Ah! Speaking of which, Sayuri likes things like divination and spiritual stuff. Well then, this third plan might be Sayuri's favourite. Of course the Sky Tree and Maumauland were also appealing, but in this power spot tour page I could feel Sayuri's commitment. "I quite like this third plan." "Yeah. I can't say it well, but I think it has a glow of your personality." "I couldn't find any articles in the magazines so I collected information from the net. That's why the completion rate of this plan pales in comparison as compared to the two previous ones." "No such thing. Your 'I want to try it!' feelings come through very well." On the map from earlier there were mysterious lines like "darkness", "restricted area" and "dead end" written... but I feel like I'll lose if I bother myself with it. When I returned the notebook Sayuri hugged it tightly and faced downwards. Even if it's not a classic dating spot, going to a place you want to go... isn't that what's important? I feel like Sayuri taught me something important. Sayuri pretty clearly wants the D here. He does have a duty for now to pretend he didn't see anything though, as that'd be pushing her too fast, but I doubt he was thinking too much about that portion, and more along the lines of "wtf I don't even for now". The way you're talking in is going in a strange direction, Sayuri-san.